Husband's plan to help wife remember after brain hemorrhage. A New York woman who suffered a rare brain hemorrhage woke up in the hospital with no recollection of her wedding just a month earlier -- until her husband devised a plan to help her remember. Tunicia Hall, 43, of Queens was in the intensive care unit at a Long Island Hospital this summer after hemorrhaging and woke up with short-term memory loss. She remembered her husband, Raleigh Hall, 50, but he soon realized she had no idea the couple had recently married. So he covered the walls of his wife's room with hundreds of photos of their wedding day. "The whole point of putting up the pictures was to connect her with those that love her," he told ABC News today. Soon enough, his wife began to remember their June wedding in Long Island. "The pictures helped," Tunicia Hall said. "I would look at the pictures and it would bring back memories." (North Shore-LIJ Health System ) Raleigh Hall and his wife Tunicia celebrate her recovery after suffering a brain hemorrhage. Friends and family members who visited also reminded her of the wedding. "They loved it because they had seen the pictures -- they're beautiful," she said. "They were remembering the day so they would talk about it, too, and help me remember." Raleigh Hall, who met his wife at church about 30 years ago, thinks the photos helped his wife heal. "We do know that with patients who come in with brain injury, things such as pictures, interactions with family -- these things can help trigger memories," Dr. Richard Temes, director of the Center for Neurocritical Care at North Shore University Hospital, where Tunicia Hall was treated, told ABC News today. 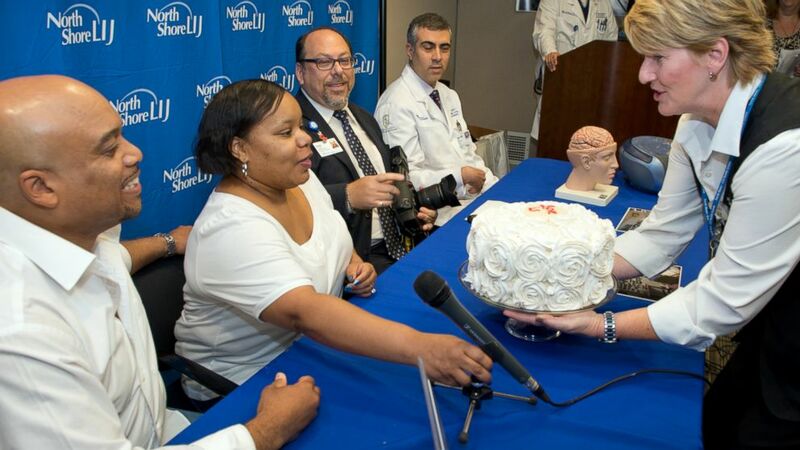 The hospital held a news conference about her recovery on Tuesday and presented the couple with cake to celebrate. Tunicia Hall is recovering at home and undergoing physical therapy. She suffered spasms in her legs and has trouble with coordination after the hemorrhaging. She thinks her memory is fully recovered.